A man has been fined after he breached a non-molestation order by visiting his ex-partner’s home. 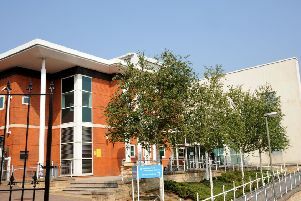 Chesterfield magistrates’ court heard on Wednesday, December 13, how Mark Shane Kingston, 30, of Wilson Close, Danesmoor, near Clay Cross, attended his ex partner’s home at Clay Cross which he was prohibited from doing by a non-molestation order. Prosecuting solicitor Sarah Haslam said: “He contacted his ex-partner outside her home address demanding money. Kingston told police he had gone to the address to arrange child care for weekends with his ex-partner and he had not realised that he was breaching the NMO. Mrs Haslam added that Kingston already has a caution for harassing his ex-partner in August and there have been seven previous police call-outs to the home address before they separated. Kingston pleaded guilty to breaching the NMO after the incident on November 3. Defence solicitor Denny Lau said it had already been decided Kingston was going to have the couple’s child that weekend but this was at a time when he had limited benefit funds. Mr Lau added that Kingston had gone to the complainant’s address to see if the matter could be varied or if his ex-partner could give him money from the child benefit. Kingston, who is dyslexic, had also been confused by the terms of the NMO and he believed he could go to the address but that he was not allowed to enter the property. Magistrates fined kingston £120 and ordered him to pay £85 costs and a £30 victim surcharge.